From Searchlove London: "I Really Want To Do XYZ"
I read this article and found it very interesting, thought it might be something for you. The article is called From Searchlove London: “I Really Want To Do XYZ” and is located at https://www.ben-johnston.co.uk/from-searchlove-london/. I went to Searchlove London last week. Despite not being the world’s most sociable man, I really enjoyed myself. The speakers were solid, the venue was nice, the coffee was good and the wifi held up for the most part. 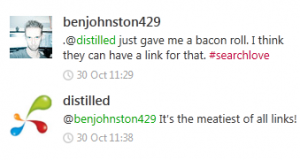 All in all, the team at Distilled put on a great event – and they gave me bacon, which always earns a meaty link. I didn’t really talk to that many people while I was there and I spent most of the breaks using their wifi to keep on top of my task list and trying to stay at inbox zero, but one thing I did hear a lot while I was outside making phone calls was the prevalence of attendees saying that they “really want to do XYZ, but”, usually referring to something content-related. People – especially those in large companies – usually resist new ideas. It’s not necessarily their fault; they have to go through numerous levels of approval and miles upon miles of red tape to even get anything looked at. My suggestion is simple: if you want to do some content or you’ve got a linkbait idea or anything else, just get it done. Write it, build it, design it, code it, whatever, just do it. From the perspective of someone that’s finally getting used to dealing with big companies, I’ve found that it’s a million times quicker to get something signed off once it’s done or far enough along that there’s something to see than it is to get approval to spend time on an idea that may never come to fruition. Just do it. If it’s worth using and if it’s on brand, they’ll sign it off quicker than they would’ve done if you’d come to them with just an idea. If they block it, look through their brand guidelines for next time. Just do it. If it’s good and your boss moans at you for stepping outside of the process, give me a shout. Did I mention that I’m hiring? Well I am, and I love creative approaches, so if your ideas don’t fit with your current agency’s process, I want to hear from you. Get in touch here, on Twitter or on LinkedIn (Update: This role has now been filled). I work with a few very large brands so I understand the kind of drama you have to go through to get things approved sometimes, but this is my suggestion to you – just get it done. Worry about the red tape with your client and the internal drama within your own agency afterwards. If you believe in your content, your infographic, your app, your widget and you have the time and skill to do it, you can handle the drama and you can justify it afterwards. If your clients trust you (and why wouldn’t they? ), they’ll approve it and if your boss is stupid enough to get annoyed with you for breaking process, talk to me. What about if you’re not a designer or a copywriter or a developer? Doesn’t matter. Personally, I have a copywriting background, so I can handle the writing, but I’m not the greatest designer in the world and my coding skills aren’t going to win any awards. That doesn’t matter – I know enough about Photoshop to put together a vaguely coherent mockup and I can usually find a way to blag enough code to put something together that I can show clients. I’m sure you can find a way too. Showing is almost always more effective than telling. If you can’t get it finished, just get something that you can show people – then you can have the budget/ time discussion. I suppose that’s the point of this post – I feel the pain of people who say “I really want to do this but XYZ”, but there’s always a way out. 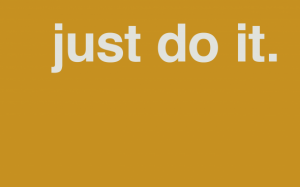 Just do it. If you’re half as good as you think you are when you’re having that conversation, you’ll be OK. If you let fear of stepping outside the process or red tape rule your work, you’ll never reach your full potential and your clients will never get to where you could take them. So that’s what I took from Searchlove London. I hope you weren’t expecting a blow-by-blow account of all the speakers – writing the same thing as everyone else isn’t my style. Do you struggle getting sign off for content? Is client or agency buy-in difficult? Let me know in the comments, I’ll throw some ideas at you that might be able to help.